I spotted this feature on cross-stitch family portraits in the November 2011 issue of Martha Stewart Living and immediately wanted to try one. The patterns are so simple, but they're full of personality and infinitely customizable. 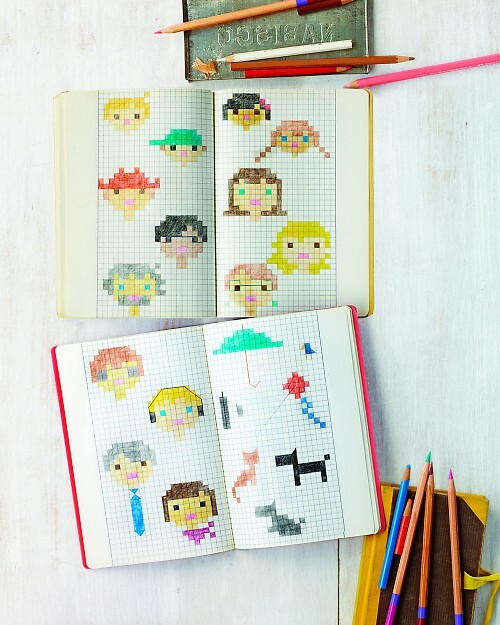 The designs are so simple that you can easily sketch them out and customize them on graph paper. There are a bunch of different hairstyles and lots of clothing options that you can tweak yourself. It's amazing how much personality a relatively few number of squares can convey. They even have templates for pets! Anyway, back to my own project. I happened to have a handy little cross-stitch computer program, Pattern Maker, that I got for free several years ago when I purchased one of these little sampler kits at Hobby Lobby. The kit came with a Pattern Maker CD that I popped in my computer to check out, and I was blown away by how cool this simple program is for designing your own stitching projects (it's a "lite" version of a more heavy-duty professional cross-stitching program). 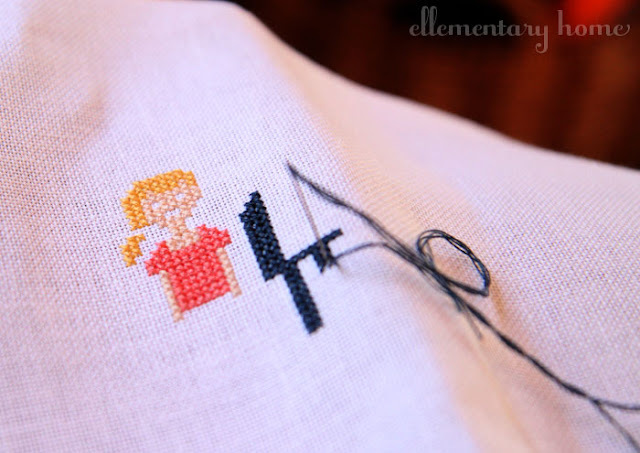 I'll spare you the full run-down on how the program works and how nifty it is, but if you're a stitcher, check it out. 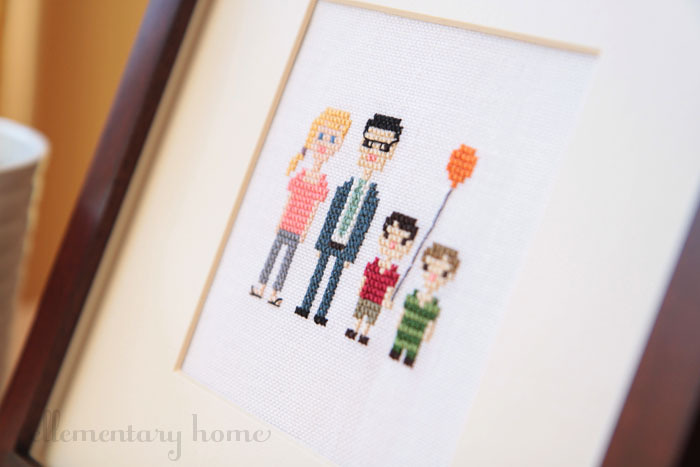 You can order the sampler kits with the software here for $10, and the website says they're still available at Hobby Lobby (sadly, I don't live close enough to a HL anymore to verify that). 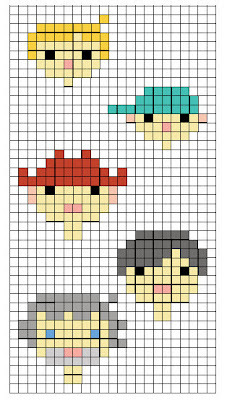 BUT, this is totally do-able the old-fashioned way, on graph paper -- that's the way the MSL editors did it. So don't let the lack of a computer program prevent you from trying this project! The software was just a fun way for me to revel in my nerdiness. The program even includes fonts, so it was easy to add our family name underneath (which actually isn't Gray -- I just picked that because it popped in my mind and I like the color gray). 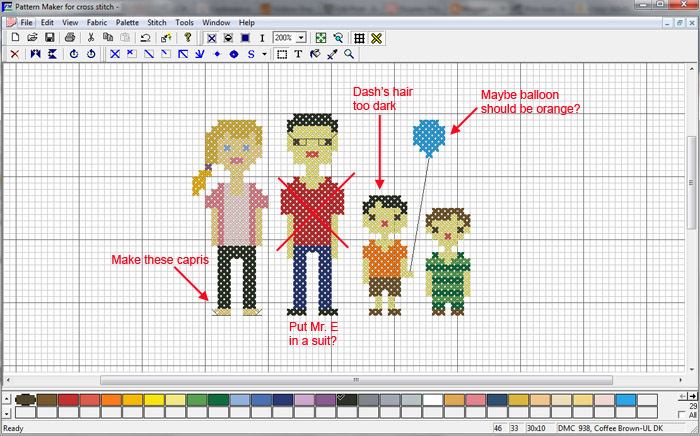 Once I had my little cross-stitch peeps charted out, it was off to Jo-Ann for a few dollars' worth of embroidery floss. I had a blast picking out the colors for all our "clothes." The skin tones were the trickiest. I used 739 for Mr. E and the boys and 3774 for me since I'm a bit pinker than them. 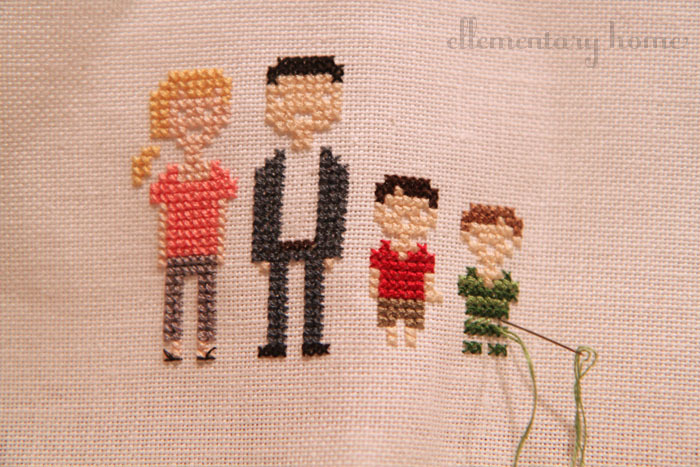 I stitched it in four short sessions over a couple of days, but you could absolutely knock it out in an evening if you were motivated. It's really quick and easy: no outlining, and no weird/exotic stitches. 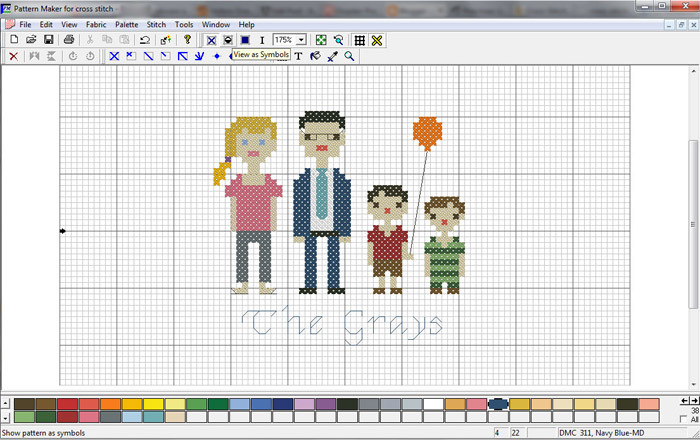 Just a bunch of little Xs, plus a bit of very basic back-stitching. I'm pretty sure the flip-flops are my favorite part. Or maybe the balloon. Or Tuck's green striped outfit (he actually has a real-life version). More about the stitching: I used 28-count linen fabric (purchased online here, but you can find similar at the big craft stores) and stitched "over two," meaning that I stitched over two threads of fabric, so it was the equivalent of 14-count. 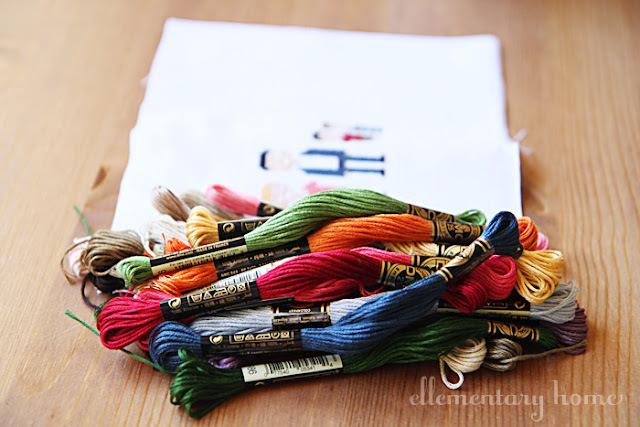 I used two strands of thread (DMC embroidery floss is six strands thick). If you have a bigger family, you might need to go with a rectangular frame. I opted not to add our family name underneath. It will be in our home, after all, so it's pretty obvious who we are! The cross-stitch portrait is going to be part of the gallery wall I'm putting together in our playroom (you can glimpse part of it in progress in the February 11 photo here; this piece is going on the left side of the window). 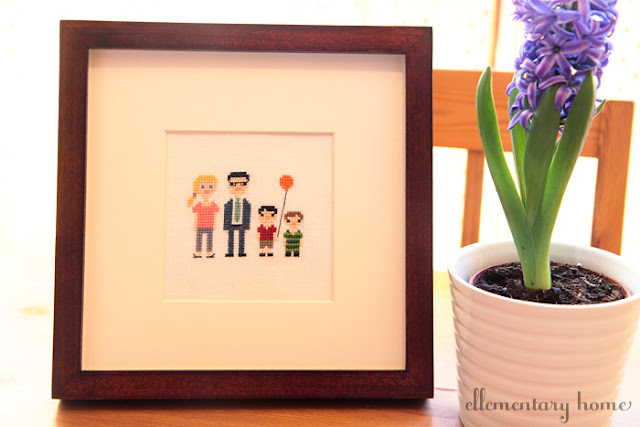 The gallery wall is all about our family, so it's the perfect place for this. I loved this project. It was easy and fun, a total delight from planning to completion. Three cheers for Martha Stewart! 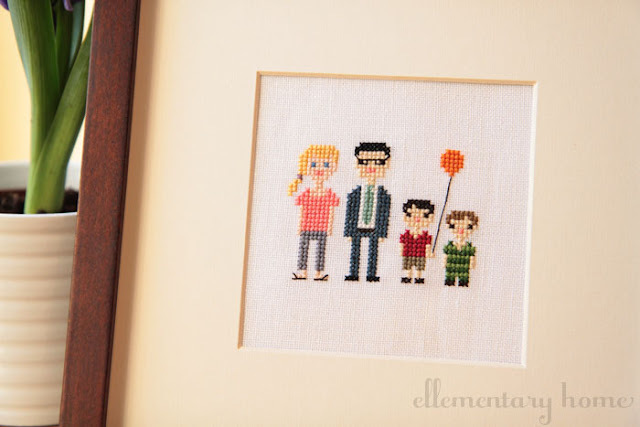 I had done a few cross-stitch projects before, but this would be a great project for a beginner. If you've ever thought about trying cross-stitch, I highly recommend this one. And if you do try it, let me know. I'd love to see how your family portraits turn out! I LOVE that!! 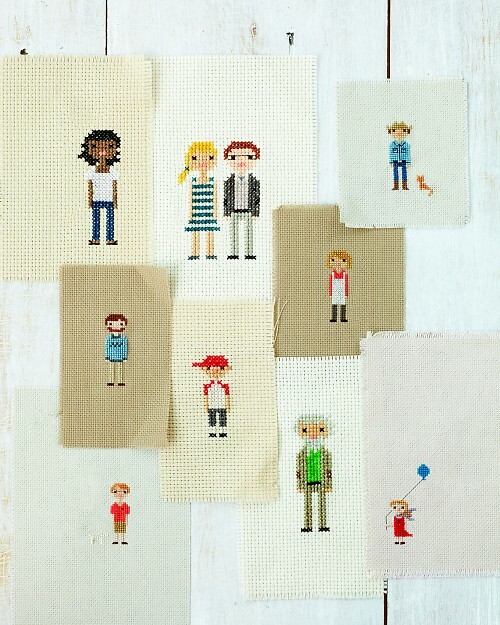 It almost makes me want to take up cross-stitching again!! I just love this!! 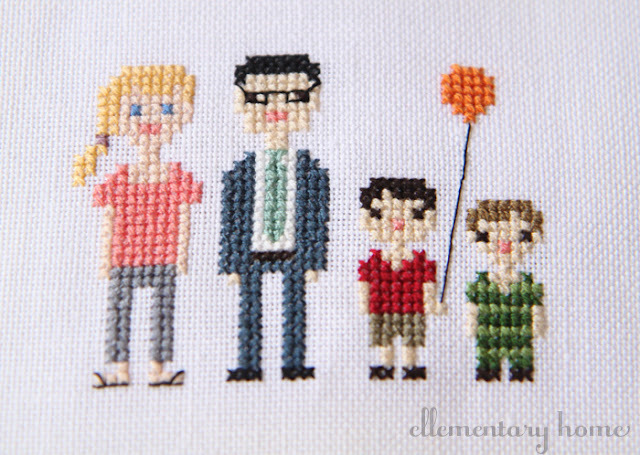 I do not cross stitch but my MIL does I am going to send her this so she can make me one for my family. (She is retired she needs to stay busy!) Thanks so much for the awesome inspiration. I am going to feature this today on Strictly Homemade and Pin it on Pintrest!! Have a great day! This is adorable. 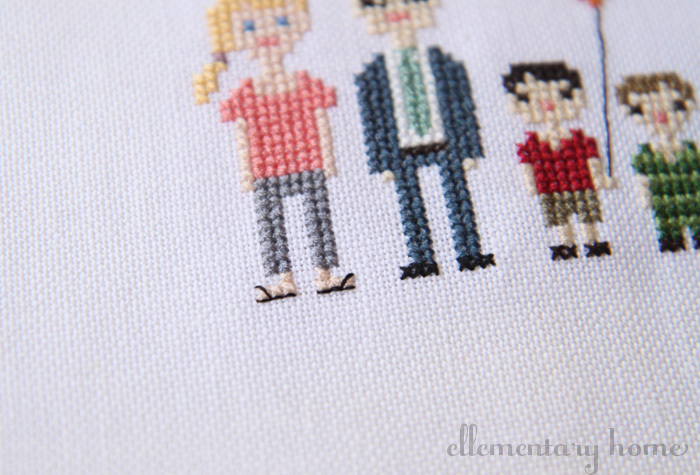 And flip-flop wearing cross-stitch you is adorable! 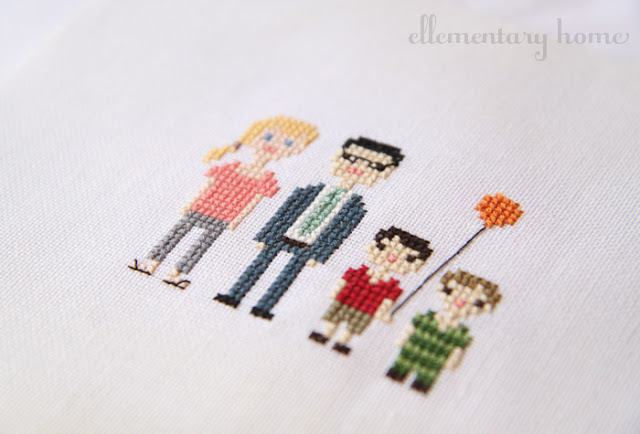 How did you get the Martha patterns into your pattern-maker? Hey! I definitely want to do this project. 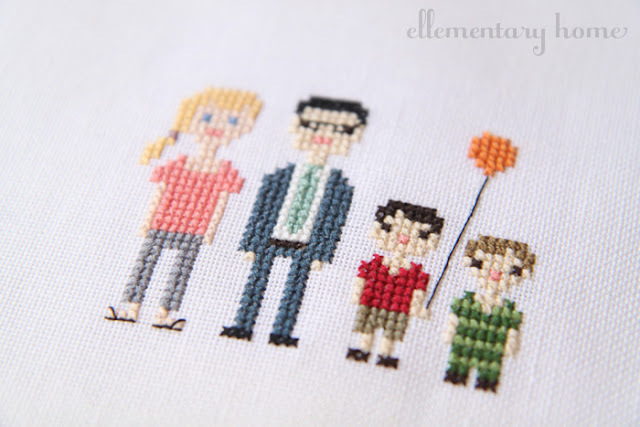 I have always wanted to try cross-stitching, but have never done it before. What materials would you recommend i get for this project?